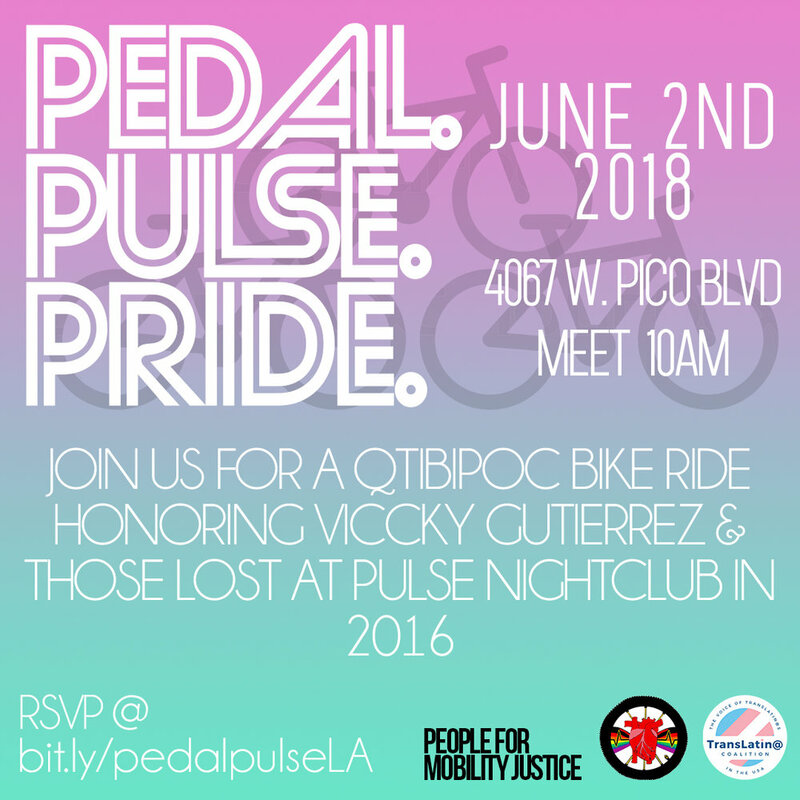 Join us Saturday, June 2, 2018 as People for Mobility Justice FKA Multicultural Communities for Mobility will be hosting the Los Angeles Pedal.Pulse.Pride Bike Ride in partnership with TransLatin@ Coalition funded by Metro. P.P.P is a bi-coastal unity bike ride born in D.C. in conjunction with Atlanta, Charlotte, Lansing, and Mendocino honoring the 49 lives lost at Pulse Night Club in Orlando, Florida on June 12, 2016. We will also be honoring Victoria "Viccky" Ramos Gutierrez who we lost on January 10, 2018 due to a hate crime in Pico-Union. All the rides are led by and centered for QTIBIPOC - Black Indigenous People of Color who identify as Queer, Trans Intersex and LGBTQIA+. We are asking ALL of our loved ones to join us in solidarity! Please join us Saturday, June 2 2018! Register HERE on our Eventbrite! Please share this ride on your social media feeds!